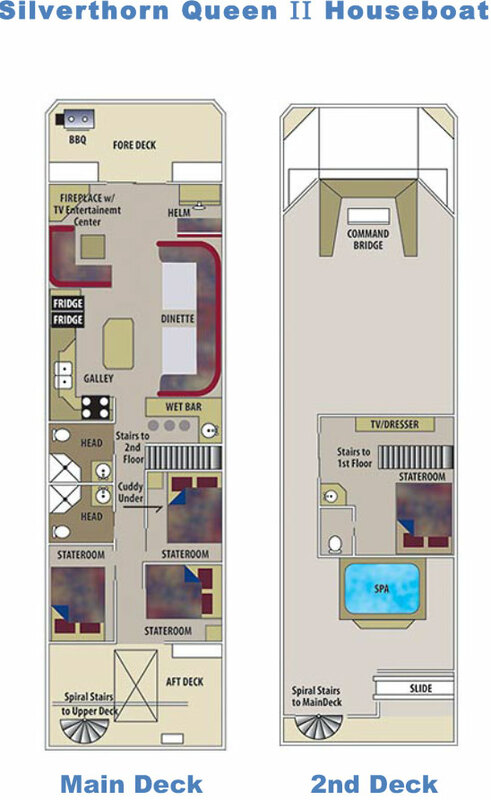 The Silverthorn Queen II was custom designed to ensure a luxurious houseboat experience on Shasta Lake. Offering many of the options available on our other Queen houseboats, this boat has a few special options including a water slide and hot tub. The private penthouse suite with its own bathroom and sundeck is quiet place to escape. A double-dinette in the kitchen ensures that everyone has a seat at dinner time – unless they prefer to dine al fresco on the fully railed third deck. If you plan to take a small boat or PWC (personal water craft), you’ll appreciate the walk space on the side of the Queen II. This space makes it easy to store your toys without blocking access. This houseboat sleeps up to 16 and is equipped with 4 private staterooms PLUS a bonus room, 2 1/2 bathrooms, spacious kitchen with two refrigerator/freezers, wet bar, bbq, fireplace, satellite tv with dvd, hot tub, and slide!